I’ve been reading about the ugly weather that has been happening this week in California. Heavy rain, wind, thunderstorm – so typical of an El Nino year. The storms that normally swing farther north to the Pacific Northwest come barreling into California and the Southwest. It is good for the drought but unfortunately, it seems to always come at once which creates chaos. We have been having a ‘non-winter’ here in the Pacific Northwest. We got a freezing blast the first week of December while we were in Hawaii and then it turned to rain. This past week it has been rather warm and gray – highs in the mid 50’s. Quite balmy for this time of the year. I’m not really complaining but you don’t know if it is just a tease and it will turn cold and stormy tomorrow. But I’ve also started to notice small signs of Spring. 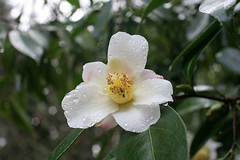 The sun is coming up a little bit earlier; buds are getting fat; winter flowering shrubs have started blooming. 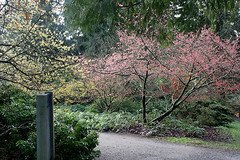 We made a trip recently to the Witt Winter Garden in the Washington Park Arboretum in Seattle. I blogged about it several years ago. A trip to the garden always cheers us up mid-winter. 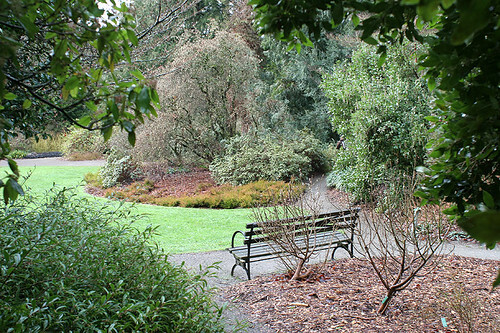 It is not a garden to rush through but instead take some time and stroll around. Perfume surrounded us as we got closer. 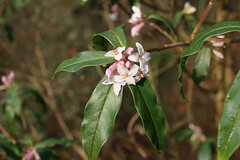 Sweet smelling Sarcococca ruscifolia was in full bloom underneath the witch hazel. 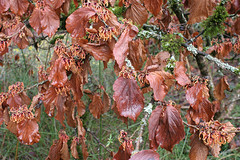 We were surprised to see the witch hazel in bloom. 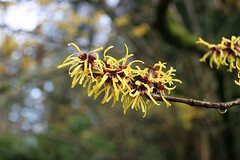 Typically we visit in February and did not expect to see much in bloom this early in January. 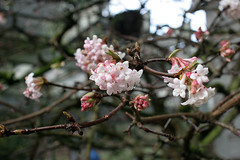 Wow, I’m amazed that you found so many blossoms in January. Love your photos. In spite of our wild and windy weather this week, which is a relief after last month’s gray gloom, spring is starting here too. I pruned roses last week and they are already budding out, my daffodils are all showing, and the wisteria and forsythia are covered with fat buds. I am glad you are being spared. what lovely gifts nature has bestowed on you. Thanks so much for sharing your photos and wonderful descriptions of seeing them. Have a great day today.